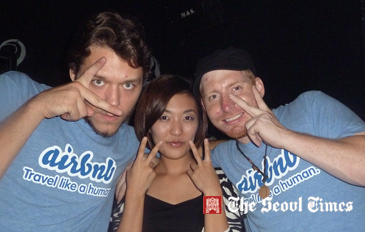 Justin Hauge and colleague Daniel Pristavec pose with a local Korean lady in a Seoul event. Airbnb (formerly Air bed and breakfast), was launched in 2008 by three San Francisco-based entrepreneurs. It is a marketplace for peer-to-peer traveling in over 7,500 cities around the world. Their open platform has accommodations ranging from a 'couch to a castle', including vacation rentals, bed and breakfast, private rooms, and entire apartments. The idea is travelers typically save money and get a local experience, while hosts have an easy way to earn extra cash and meet new people. Airbnb is reputation-based. It is a safe, secure, and reliable system that includes online credit card payments, user profiles, and reviews. Although Airbnb has been quite successful domestically and abroad, many challenges still exist in developing the Asian market. “The biggest issue by far has been the language and cultural barriers encountered”. As the site continues to grow, these cultural barriers will fall and this method of travel will become more widely embraced by the Asian community. Justin Hauge and colleague Daniel Pristavec organized an “Airbnb Meetup” on Saturday, Sept. 11, 2010 at Itaewon in Seoul city. The party was attended by the hosts, travelers and friends of Airbnb from the Seoul community. The attendees discussed the current status of Airbnb in Seoul and how to make this way of travel more accepted within the Asian market. After Seoul, these two young men will continue traveling to other Asian cities, Bangkok, Phuket, Shanghai, Manilla, Beijing, Singapore, and Tokyo.